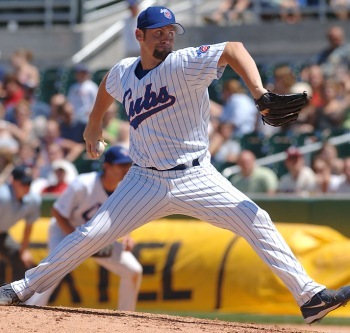 Scott Williamson is a pitcher who, like Mark Prior and Kerry Wood, started out with tremendous promise but whose career was derailed after two years by arm problems. That includes Tommy John surgery after his second year and shoulder problems more recently. Let's see if we can figure out what happened. A pitcher's arm action and timing are the primary determinants of the long-term health of their arm, so it's always the first thing I look at. As the clip below demonstrates, Scott Williamson's arm action is problematic. The issue is that, like Chris Carpenter, BJ Ryan, and Kerry Wood, Scott Williamson has a major Inverted L in his arm action. This ruins his timing and is the root cause of his elbow and shoulder problems. Scott Williamson's Inverted L is easier to see in the still photo above. The thing to notice is how his Pitching Arm Side (aka PAS) elbow is at the level of his shoulders and his PAS forearm is hanging down vertically beneath it. This will increase the distance over which, and the force with which, Scott Williamson's PAS upper arm will externally rotate, which will put significant stress on both his elbow and ultimately his shoulder.